Q: Is the Women’s Chamber of Industries & Commerce (WCIC) playing its envisioned role in national development? A: The chamber has contributed to Sri Lanka’s development agenda from the time it was established in 1985. We have upheld our mandate of empowering rural and urban women, to develop their entrepreneurial skills and career prospects – this is the need of the hour as over 50 percent of Sri Lanka’s population is female. If women do not enter our country’s workforce and productively engage in economic activities, Sri Lanka’s ambitious plans to build an economy on a par with regional giants will not become a reality. Q: How do you view the biz climate from a woman entrepreneur’s perspective? A: Public-private partnerships are the way forward. Sri Lanka’s women entrepreneurs are becoming more assertive, and entering conventional and non-conventional businesses. There’s also a growing trend of innovation with women venturing into areas of commerce that were hitherto male bastions or simply new opportunities to exploit. This is a positive sign as women are opening new avenues of commerce that will ultimately benefit employment and the broader economy. Q: Are there challenges that women entrepreneurs continue to face? A: While more women are venturing into business, financing, product development and marketing are the three main hurdles. Basically, what women need is a permeation of skills and knowledge on how to run a business, the elements needed for a cohesive enterprise, approaching funding channels, maintaining consistent quality in products and packaging, and matching products with customer profiles. Q: And how can the chamber assist in driving business and addressing challenges? A: We collaborate extensively with regional women’s chambers in Sri Lanka and through the SAARC Chamber Women Entrepreneurs Council. Having built a strong voice of advocacy, we have developed good relations at national and regional level, and some of our representations have influenced national policy. We also engage in lobbying internationally for better opportunities for Sri Lankan women through the network of other regional chambers in South Asia. Q: Are women being supported to maximise their potential? A: There’s always more to be done. And as women, we are the best to work on obtaining that support. WCIC is working on a proposal to introduce flexible working hours for women. As the primary caregivers who often have to juggle a career and family, women benefit from flexi hours. Countries where this system has been introduced are witnessing high productivity. We’re also drawing up a proposal to be represented to government for a percentage of state procurement to be allocated to women entrepreneurs. Q: How do you view women’s representation in parliament, and the public and private sectors? A: One aspect we lobbied for – i.e. 25 percent female representation – has been passed under the Local Government Bill. This is a positive step, and we will continue to lobby for this to be extended to all areas of government and boardrooms as well. Compared to our regional counterparts, we’re far behind in terms of women’s representation in parliament. We boast the first woman prime minister in the world but our glory ended there. To continue writing history, we must encourage more women to take up leadership not only in government but also in boardrooms and at the grassroots. 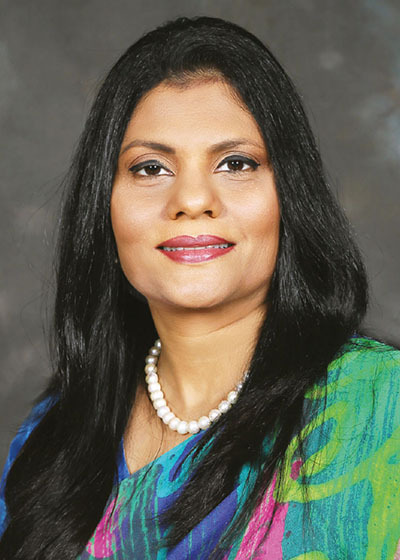 Q: Do Sri Lankan businesswomen have the potential to go global? A: Most certainly. IronOne Technologies’ Lakmini Wijesundera, designer Yolanda Aluwihare Holm, Barbara Sansoni’s Barefoot and Sandra Wanduragala’s Selyn handlooms have taken indigenous Sri Lankan brands to the world. Q: How does the chamber compare with its regional counterparts? A: WCIC played a key role in supporting the establishment of chambers in this region. We have also been a catalyst in policy advocacy and a voice for women entrepreneurs in Sri Lanka. But compared to the region, we need to be more aggressive and visible as we engage in a variety of activities. Q: Finally, what is your vision for women in Sri Lanka? A: Women must be recognised for the integral role they play in developing and uplifting the nation. This must not stem from women alone, but both men and women who together will ensure that females are given their due place in this country.